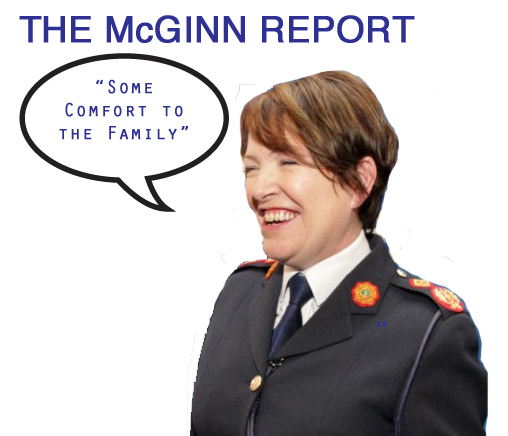 Garda Commissioner Noirin O’Sullivan said she hoped the report would bring some comfort to Fr Molloy’s family and it had also vindicated some of the work of the garda review team. But she felt that, 30 years on, it was unlikely that inquiries would shed any new light. “Some comfort to Fr Molloy’s family” . honestly what is this woman talking about ? What exactly does she mean by this statement ???? The investigation into the 1996 murder of Sophie Toscan du Plantier is still “live and open”, said Garda Commissioner Nóirín O’Sullivan. She said the force will recruit more data analysts to strengthen the investigative capabilities that were central to the conviction of Graham Dwyer. She said a wide-ranging programme of reform was under way and when the strategic transformation office spearheading it was fully operational, communication between it and all Garda members would be a priority. She said while the Garda was praised following the conviction of Dwyer for murder, she was conscious there remained a family grieving for Elaine O’Hara. And while a jury had rejected accusations by Ian Baileythat gardaí had conspired against him when investigating Ms Toscan du Plantier’s killing, the case remained unsolved. She believed the investigation of Dwyer, a 42-year-old architect, for the murder of Ms O’Hara underlined the professionalism of the Garda’s investigative work. She said Garda James O’Donoghue had shown great tenacity in investigating the provenance and significance of the items found in Vartry Reservoir and Garda Bríd Wallace and Sgt Alan Browne had “trawled through absolutely tonnes of very horrific footage”. Civilian analyst Sarah Skedd had done excellent work in analysing the data on the phones linked to Dwyer that proved central to the investigation, she said. These would help in the presentation of often complex data in an “understandable manner” to juries in major trials. Commissioner O’Sullivan said the McGinn report into a Garda review of the investigation into the killing of Fr Niall Molloy in Clara, Co Offaly, in 1985, vindicated the review team. On the McGinn report, she said she was also very conscious there was a bereaved family at the centre of the case. She said she hoped the report would bring some comfort to the family. It appeared the work of the serious crime review team had been vindicated but she said she took no comfort from that. She said if anyone had any new information on the death of Fr Molloy they could come forward with it, but she said she did not think it was right to hold out hope, 30 years later that new evidence was likely to establish anything new.